Barnes & Noble Inc. is continuing to expand its full-service restaurant concept, opening the fourth unit Friday in Plano, Texas. As part of a restaurant development program announced last year, the bookselling giant’s new store at the multi-purpose Legacy West development is the fourth Barnes & Noble Kitchen, joining earlier opening in Edina, Minn., Folsom, Calif., and Scarsdale, N.Y.
“This store is part of our ongoing effort to test new concept stores,” said Demos Parneros, Barnes & Noble CEO, in a statement. “We are still learning from all of the new stores that we have opened across the country, and we are excited about the knowledge we have gained in these markets,” he said. The store is one of the new smaller-format prototypes being tested by the company. It covers 10,000 square foot and seats 113 in the full-service restaurant and patio. A counter bar also offers wine and craft beers on tap. The design features ash-wood surfaces for the bookshelves and a mix of concrete, carpet and wood floors throughout to “help make various sections of the store feel intimate and distinct in their purpose,” the company said. A community worktable with electrical outlets is also available. Large accordion doors allow the restaurant to open onto a patio for outdoor dining next to a water fountain. The menu offers a range of appetizers, salads, entrees, shareable items and desserts. Prices for entrees range from $14 for grilled cheese and tomato soup to $22 for plancha-cooked salmon with tabbouleh salad and basil dressing. Side vegetables are $4 to $5. Specialty coffees and other drinks are also on the menu. 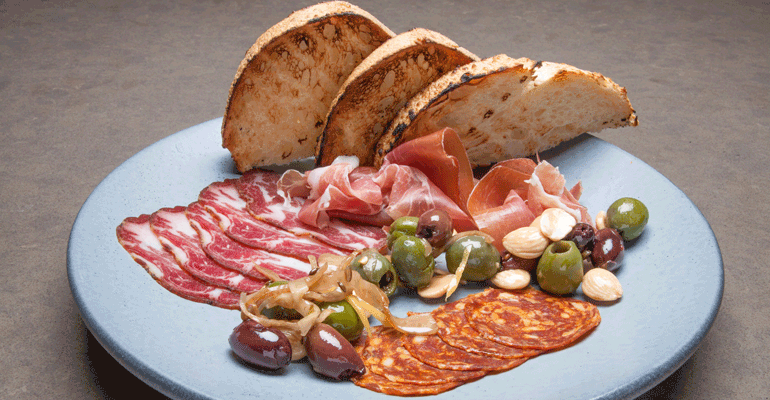 The restaurant team is led by chef Robbie Nowlin, who previously was executive head chef at Boudro's Texas Bistro and Zinc Bistro & Wine Bar in San Antonio, Texas. The company said the unit will offer book fairs, book signings as well as music events. Barnes & Noble has 632 bookstores in all 50 states. Many of the bookstores already have Starbucks cafés that offer pastries, sandwiches, coffee and free Wi-Fi. 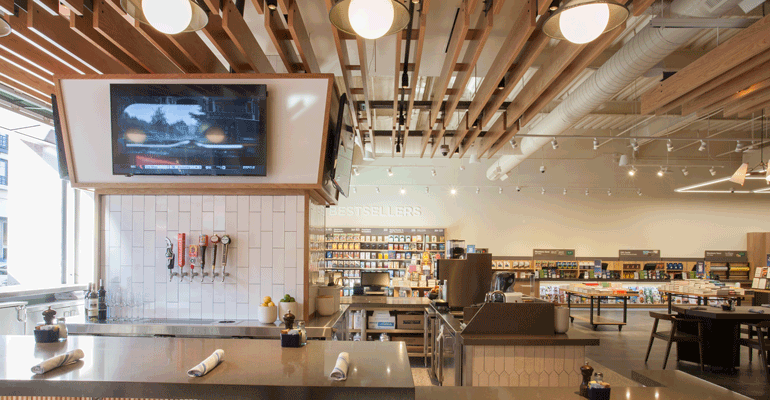 The bookseller is also tapping into the growing trend of brick-and-mortar retailers, facing increased competition from online sales, who are enhancing the customer experience with foodservice. 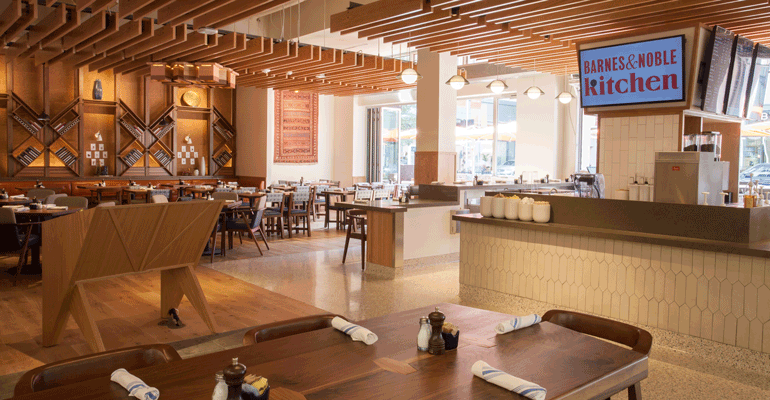 Other retailers include the Seattle, Wash.-based Tommy Bahama clothing company with its Tropical Cafes, Corte Madera, Calif.-based Restaurant Hardware Holdings Inc.’s 3 Arts Club Café in Chicago and even the recent New York-based Tiffany & Co.’s restaurant, which opened this week at its flagship Manhattan location.